â™¥Guest Postâ™¥ This is the final part of a guest post fromÂ Crystal ofÂ Watermoolen on products from Spa de Soliel, which were sent complimentary to her for review on behalf of Viva Woman. 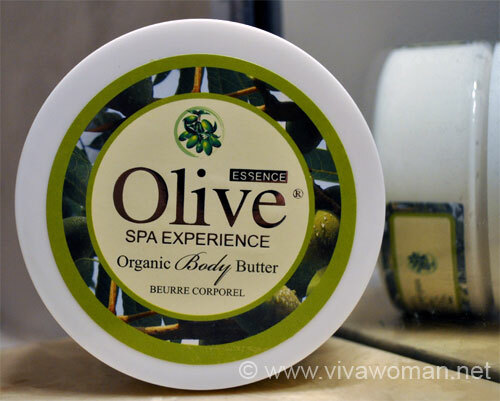 Earlier, I’ve reviewed three products from the Organic Olive Essence product line – the Gold Healing Nutrient, the Body Butter, and the Hand Cream. Â Today, I’m reviewing their Facial Gel Cleanser, described as a paraben-free face cleanser enriched with nourishing olive oil, olive extract and Dead Sea minerals, suitable for all skin types. Organic Aloe Barbadensis Leaf Juice, Organic Oryza Sativa (rice) Extract, Organic Citrus Medica Limonum (lemon) Peel Extract, Organic Olea Europaea (olive) Fruit Extract, Organic Olea Europaea (olive) Fruit Oil, ESP Organic Safe Surf, SC Pro, Organic Safe Guard, Salt. This cleanser is non-foaming which means that it may feel like you’re putting water on your face. If you try to “rub” your hands together when applying the product, you will not experience any suds. The reason is that there are no “sulfates” or “foaming” ingredients in this cleanser, which may actually dry your skin even further. 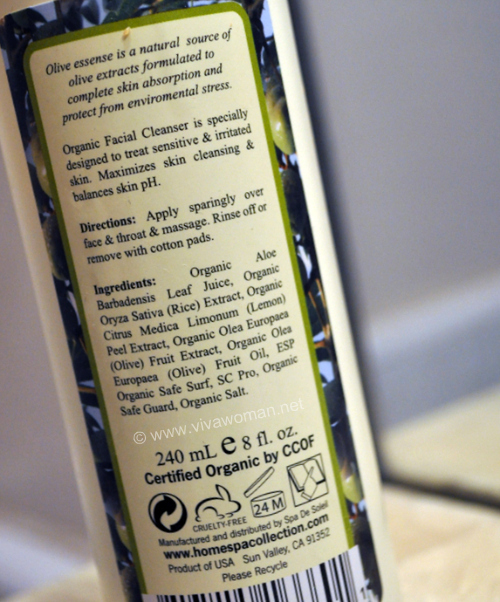 In addition, like I’ve mentioned in all of the reviews for the Organic Olive Essence line, there are no parabens. There is, however, salt in this cleanser, which can act as a natural preservative. Make sure to follow the directions on the bottle! Since this cleanser contains a high amount of lemon extract (it is the third ingredient), make sure you apply “sparingly” onto your face. 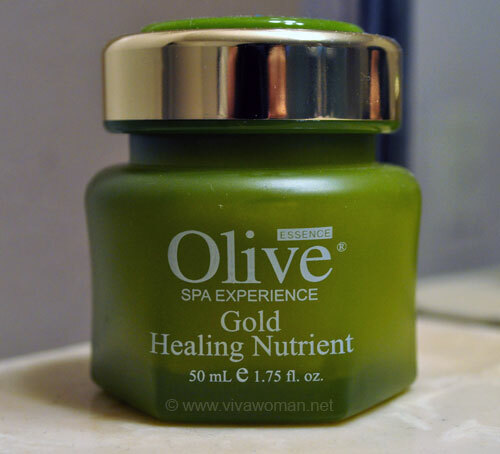 This means to only apply a LITTLE BIT to your face, especially for those with sensitive skin. I think the website may have made a mistake because the directions on the site indicate, “apply a generous amount to the face and throat and massage gently.” However, on the bottle, it says to “apply sparingly.” If you apply a lot, it may actually sting your face! Since I’m used to foam from my cleansers, I applied a lot of this product thinking that it would compensate for the non-foaming properties. It was a mistake because it stung my face, and the stinging didn’t stop until maybe thirty minutes later. So, a little bit definitely goes a long way! Like most organic and natural cleansers, it is hard for this cleanser to remove makeup (even tinted moisturizers). To reap the benefits from this cleanser, make sure to use baby wipes (or any makeup remover) before using this cleanser. But, remember that this product includes natural ingredients which is different than most cleansers that use chemicals to remove makeup. Since this cleanser is in a gel form and contains no foaming properties, my skin did feel soft and moisturized after I washed it. It seemed like the moisture in my face was retained. The cleanser did not cause any breakouts nor did it really clear my breakouts quickly. It’s still noncomedogenic so it’s safe to use as a way to clean your face on a daily basis. 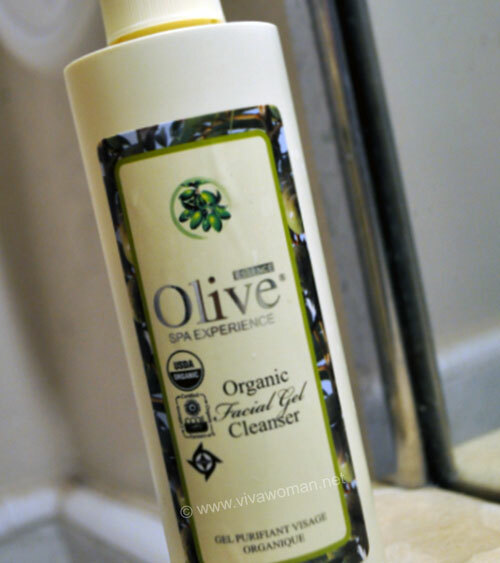 When I first used this cleanser, the smell took me by surprise! I immediately thought that it smelled like a “pizza” scent, but to be more accurate, it smells like tomato juice! It’s weird because there are no signs of tomato ingredients in the product. It’s not very off putting, but it did take me by surprise. It’s good that this scent is au natural since there are no added artificial ingredients to this cleanser. Even though I had to add an additional step to my cleaning regimen (using baby/makeup remover wipes before washing), I still enjoyed this natural and organic cleanser more than other organic/natural ones that I’ve tried. For those who do not put on makeup, this cleanser may be a good option. I like the fact that it’s in a gel form, has no artificial fragrances, and seems to handle well with my sensitive, acne-prone skin. However, I am still used to foam when it comes to cleansers, so it did take a while to get used to. This 8 oz facial gel cleansers costs $24.99 at the Home Spa Collection. This product could last for about one month and a half when used twice daily. this is quite an interesting cleanser… i think it’ll be suitable for cleansing in the mornings when you dont sleep with makeup on and just need to cleanse off excess skincare creams or sebum secretions.. is this a US based website?? I like the simple ingredients…except for Lemon Peel Extract. Would that cause photosensitivity? The ingredient would cause photosensitivity but this being a cleanser, I think chances of it staying on the skin is low.